This is an educational study of the early handwriting of Ronald Reagan and his mother, Nelle Reagan. It was discovered by the authors that many collectors and dealers were unable to teil the difFerence between the two handwritings. The authors primary objective is that after reading this study, even a novice will have the knowledge to look at what is reported to be a letter written by Ronald Reagan and be able to discern whether the letter was written by the hand of Ronald Reagan or his mother. Many items have been traded or sold believing it was signed by Ronald Reagan when in fact it was signed for him by his mother. Single items and entire collections of letters that have been described äs written and signed by Ronald Reagan have been sold for very large sums of money. However, many of these letters have been described incorrectly because they were actually written and signed by Nelle Reagan. We would like to beu'eve this was done innocently. Little information on this subject was available until the printing of this educational study. As this study is being written, there is a handwritten letter for sale on a dealers website for $10,000 for what is wrongfully described äs a handwritten letter by Ronald Reagan. Elsewhere, a California auction house has offered a large lot of what is described äs over 100 signed handwritten missives and 35 signed typed letters affectionately signed "Ronald Reagan," "Ron" or "Dutch." Not once does the catalog descripüon mention that many of the letters being offered are actually written by the hand of Nelle Reagan. Also included are signed and inscribed Christmas cards reportedly from the Reagans. The archive is expected to bring in 100,000 dollars to 150,000 dollars. During the late 1930fstothe late 1950's, itis the authors opinion that everything that appears tobe written and signed by Ronald Reagan should be considered suspect. 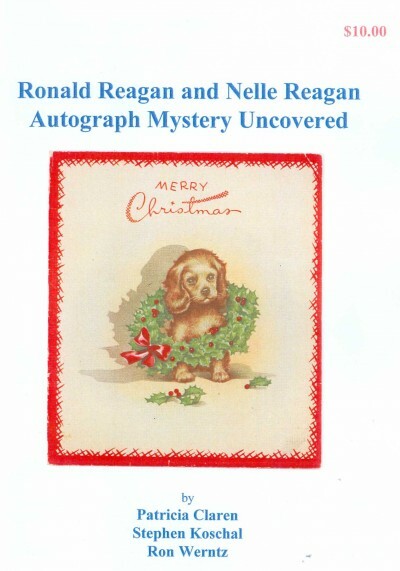 Even the most personal items such äs the "Ronald, Jane and The Children" Christmas card which is illustrated on the front and back cover of this study is not inscribed by Ronald Reagan. To most, the handwriting on this card: "Hello! Rosemarie, From your friend" would appear to be the early handwriting (circa early 1940's) of Ronald Reagan. It is not, the writing is by the hand of his mother Nelle Reagan. We are sure most will agree, every story should have a beginning, a middle and an end. The authors have enjoyed a unique experience collaborating information and even though certain words or phrases may have been that of one individual or another, the finished study is without question the result of a mutual effort.